Clashes between opposition protesters and security forces here spilled into Tuesday, with the government confirming a second death in skirmishes that have flared since late Sunday. Bahrain’s King Hamad bin Isa Al Khalifa, in a TV address, offered condolences for the deaths, pledging an investigation into the killings, and promising to push ahead with reforms, which include loosening state controls on the media and Internet, according to the Associated Press. As violence continued, parliamentarians from the country’s main Shiite opposition bloc suspended their participation in the body in solidarity with the protesters. The bloc, called Al-Wafaq, controls 18 of Bahrain’s 40-seat parliament. The move raises a new hurdle for Bahrain’s Sunni ruling family, robbing it of a legitimate, political counterparty with which to negotiate a settlement to the unrest. A funeral for the first man killed swelled into a massive protest Tuesday, drawing in thousands as the crowd marched from a Shiite village, the man’s hometown, to a central square in the capital. A demonstrator waves a Bahraini flag on a highway overpass overlooking the Pearl Monument centered on a main square in Manama, Bahrain, Tuesday Feb. 15, 2011. By midafternoon, protesters occupied the Pearl roundabout, a prominent landmark that forms a main intersection in the city’s financial district. 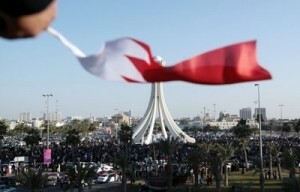 Young men, many carrying Bahraini flags, used ladders to mount the stone sculpture in the center of the roundabout. Crowds sang songs of defiance and lifted banners, some in English, pledging “peaceful protest.” Passing cars tooted horns in support, while police helicopters circled overhead. Early Tuesday, thousands of demonstrators gathered at the Salmaniya Medical Complex, where injured protesters from Monday’s clashes had been taken. They gathered to mourn a young man that the hospital said had been killed Monday by pellet wounds. Eyewitnesses said security forces had shot the man at close range with pellets designed to disperse crowds. As protesters on Tuesday escorted the dead man’s body from the hospital for burial, security forces intervened, attempting to disperse crowds, eyewitnesses said. Police fired tear gas and more pellets. 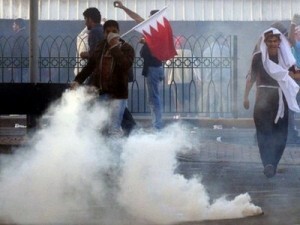 Tear gas filled part of the hospital’s accident and emergency ward, eyewitnesses said. In the melee, a second man was killed, the interior ministry confirmed Tuesday. 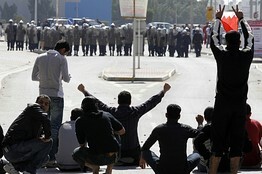 Bahraini authorities reiterated late Monday that security forces were only using proportionate force. Bahraini protesters look at a tear gas canister fired by police to disperse them in the village of Sanabis near Manama. The two days of clashes in Bahrain represent a significant escalation of the Arab unrest that has fanned out from Tunisia, culminating in the resignation of Egypt’s Hosni Mubarak on Friday. Bahrain is the only Arab state so far in the oil-rich Persian Gulf beset by unrest amid protests across much of the rest of the Middle East. Bahrain is a small island kingdom, with little oil wealth of its own. But it’s home to a thriving, regional banking and financial-services sector, and hosts the U.S. Fifth Fleet, the American naval command in charge of patrolling the Persian Gulf and the surrounding region. Sunni rulers have struggled for years with a restive Shiite population. In recent days, the Shiite-led opposition has capitalized on the regional unrest to renew its own calls for political reform. A woman, who identified herself as Naseema from Al-Daih, said the clashes between opposition Shiites and security forces had hardened protesters’ resolve. “We’re not afraid of their jails, we’re not afraid of death, we’re willing to give our own blood and our own sons,” she said, as she waited for afternoon prayers.